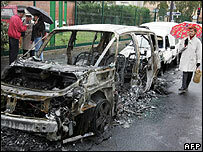 The authorities have cleared away the burned-out vehicles from in front of the tower blocks in Clichy-sous-Bois, but the smouldering resentment felt by the area's young residents cannot be extinguished so quickly. Groups of boys and young men still hang around outside the area's shops and cafes and treat strangers with deep suspicion, if not outright hostility. Although some complain that their voices are never heard, as we tried to speak to local residents, we were told at one point to leave the area or risk being attacked. The nights of violence over the past week have given some young men a rare sense of control - even if it is only of the streets where they live. "There is a dangerous cocktail here," said Ahmed Belmokhtar, a taxi-driver of Algerian origin, like many of those who live in the poor, crime-ridden estates like Clichy, which ring Paris. He listed the rampant unemployment, heavy-handed policing, discrimination, poor housing and a concentration of large numbers of immigrants from North and West Africa, along with their descendents. Many feel that the state ignores them at best and at worst stands in the way of their attempts to escape the estates. The friends of Bouna and Zyed hope they rest in peace. The most recent spark to ignite - all too literally - this cocktail was the death of two young Clichy boys of African origin - Bouna Traore, 15, and Zyed Benna, 17 - allegedly as they ran away from the police. Photos of the pair with the words "Rest in peace" are being sent round mobile phones in the area. 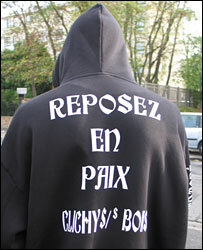 Some of their friends are wearing black sweat-shirts emblazoned with the slogan "Dead - for nothing". The death of a child is always extremely emotional but the undercurrent of alienation has been there for many years and has periodically spilled over into violence. The run-down, graffiti-ridden tower-blocks, some with broken and boarded-up windows, stretch for miles and miles. Those who live there say that when they go for a job, as soon as they give their name as "Mamadou" and say they live in Clichy, they are immediately told that the vacancy has been taken. When high numbers of unemployed young men live together, the outcome is often violence. A young woman, Maratt Sabek, said that black and Arabic women do not face nearly as much discrimination in the job market as their brothers. But what will the violence achieve? "It's catastrophic - we're the ones who suffer," said one young woman, who was too afraid to give her name. The cars and shops which are burnt belong to those who have managed to find a job and save up despite all the obstacles they face. One woman who is visiting friends and relations in Clichy said she was astonished to see the flames and hear the police sirens, saying it reminded her of home - Algeria, where a decade-long civil war has just about finished. This may be an exaggeration but it is a comparison which would still shock many French people who have never seen the near-third world deprivation in their midst. The owner of a smart gents outfitters in nearby Aulnay-sous-Bois - which has also seen several nights of rioting - said that his sales had crashed by some 30% in the past week. "People are afraid - they know their car could be burnt tonight," he said. And train-drivers and conductors have gone on strike after their colleagues were attacked, making it even more difficult for Clichy residents to travel to other parts of the Paris area where work can be found. And yet, as always, life carries on. One woman carrying huge bags of onions and potatoes to her flat confessed to being too afraid to go out at night over the past week or so but said she had not actually witnessed any of the violence herself. Just three blocks away, the car-park remains littered with burnt-out rubber and shattered glass. Ahmed, the taxi driver, says while Clichy's residents are only adding to their own suffering in the short term by their violence, it is their only way of "sounding the alarm". "In the long term, it will force the government to do something for the area. Otherwise, the next round of violence will be even worse."